Place your cursor in the text panel where you want a symbol to appear. Go to the Format Text tab, and click Symbol. 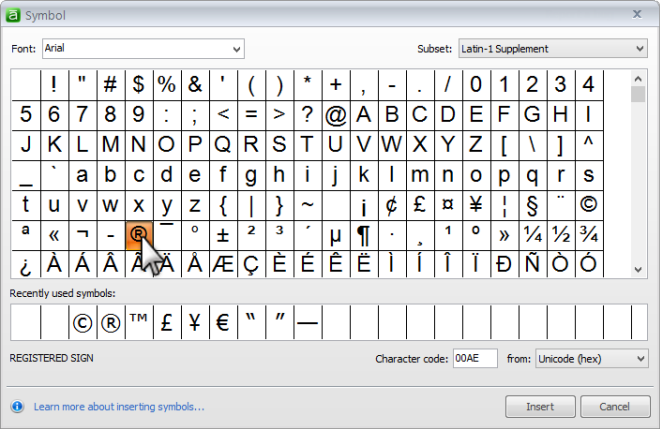 Browse additional symbols by choosing a different font from the Font selector in the upper left corner. Choose a different character set in the from: selector in the lower right corner. Choose a different Subset of characters in the upper right corner if you chose the Unicode (hex) character set in the from: selector. Enter the code for the symbol directly into the Character code field at the bottom of the window if you already know it.